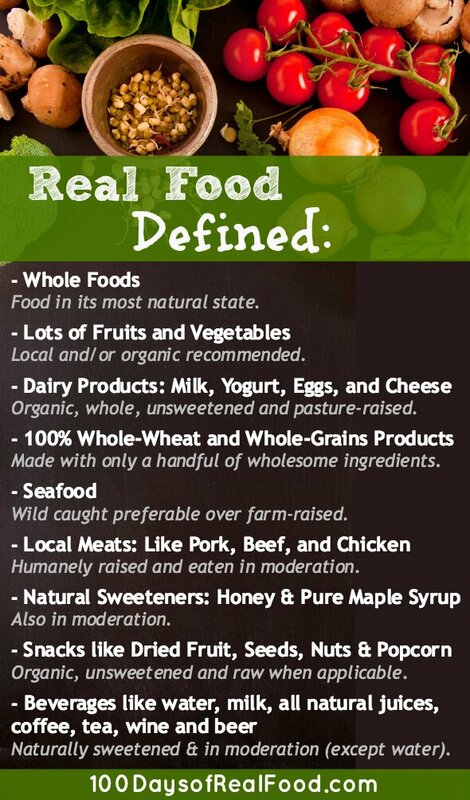 Below are the rules we followed during our original 100 Days of Real Food pledge. If you are taking the 10-Day pledge you will follow these same rules. Please leave a reply below if you have any questions about what is okay to eat during your pledge. Read the ingredients label before buying anything. For years, if I even looked at food labels, I was reviewing items such as fat grams, calorie count and sugar content. While this may be important to some, the best indicator of how highly processed a food is can actually be found in the list of ingredients. If what you are buying contains more than 5 ingredients and includes a lot of unfamiliar, unpronounceable items you may want to reconsider before buying. 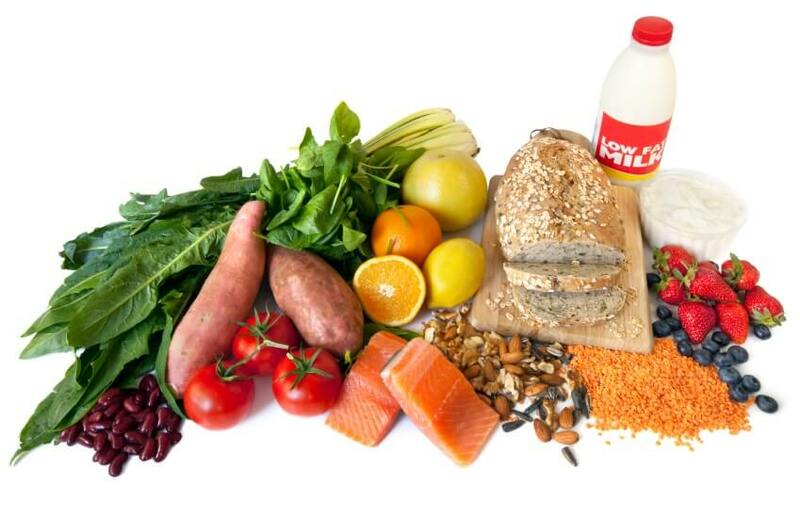 Increase your consumption of whole foods especially vegetables and fruits. I am sure you’ve heard similar advice a thousand times, and I hate to tell you that it couldn’t be more true. This will help to displace the processed foods in your diet, and will actually make your food selections in general very simple. No more counting calories, fat grams, or carbs when your only concern is selecting whole foods that are more a product of nature than a product of industry. Buy your bread from a local bakery. I actually used to eat white bread, but what I bought for my husband from the grocery store was what I thought was whole-wheat bread. When we finally checked the ingredients and found 40 different items on the list, including white flour and sugar, we decided it was time for a change. Why would there be so many on the list if it only takes a handful of ingredients to make bread? We since started buying our bread from Great Harvest Bread Company. Not only do they grind their own wheat every morning, but their honey whole-wheat loaf only has five ingredients – whole-wheat flour, water, yeast, salt and honey. In addition to your bread choice, when selecting foods like pastas, cereals, rice, and crackers always go for the whole-grain option. And don’t just believe the health claims on the outside of the box. Read the ingredients to make sure the product is truly made with only 100% whole grains – not a combination of whole grains and refined grains which is unfortunately how a lot of “whole grain” products are made. The white flour or other refined grain alternative is simply high in calories and low in nutrition. Avoid store-bought products containing high-fructose corn syrup (HFCS) and those “that have some form of sugar (or sweetener) listed among the top three ingredients” according to Michael Pollan. Despite the mixed research on if HFCS is really worse for you than good ol’ white sugar, it just happens to be “a reliable marker for a food product that has been highly processed”. Don’t order off the kids’ menu. The next time your family is out to dinner try to avoid the kids menu. Those selections are most often things like pre-made chicken nuggets, fries, and pasta made with white flour, among other things. Instead try assembling some sort of side item plate (like baked potatoes and whatever else your kid will tolerate) and/or try sharing some of your meal. Visit your local farmers’ market the next time you need to restock your fridge. According to Michael Pollan not only will you find “food that is in season, which is usually when it is most nutritious”, but you will also find a selection of pesticide-free produce and properly fed meat products. It is also better for our environment to purchase locally grown products as opposed to the supermarket produce, which travels on average 1500 miles from the farm to your plate. Lastly, to once again quote Michael Pollan, he says to “eat all the junk food you want as long as you cook it yourself.” If you had to peel, chop and deep fry potatoes every time you wanted French fries then you might not eat them very often. Only eating “junk food” such as cakes, sweets, and fried foods as often as you are willing to make them yourself will automatically ensure the frequency is appropriate.